It seems to be a trend that nations living in a hot climate, love hot stuff: take Indians and their love for spicy food and hot tea. But it also works vice versa, people living in colder regions love cold stuff. Like the Swedes, who seem to use any opportunity to jump into cold water. And, Icelanders love for ice-cream! There are more ice-cream parlors in Reykjavík than there are public hot tubs. And none of them see to be going out of business. One of the reasons for this might be the "Ísbíltúr". So what is it, you ask? "Ísbíltúr" roughly translates as an "Ice cream road trip". It might sound a bit random, but it is in fact a very well-defined cultural recreation. It goes down like this: The driver heads in the direction of the family's favorite ice cream shop with a generous amount of detours. Awarded for their patience, everybody gets to choose their ice cream and toppings. 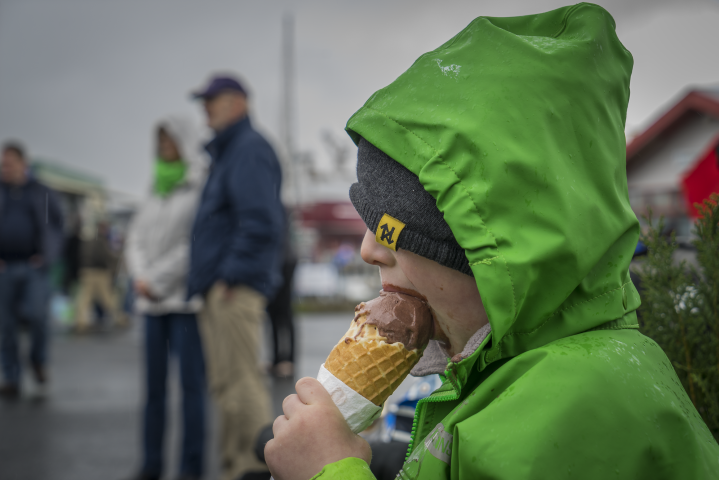 Then the road trip continues, with the drivers aimlessly navigate the streets of Reykjavík while trying to eat ice cream at the same time. The road trip usually leads to nowhere but home, so it's more about the journey than the destination. Some might think this activity is seasonal, but so is not the case. Summer, winter, spring or autumn - there's always space for some ice cream. If you're wondering how to pronounce it, here you go: "ease-beel-tour." So where do we go for our "ísbíltúr"? Everybody has their own preference and traditions. Our editor likes to go to "Ísbúð Vesturbæjar" and get the "old school", more milky type of ice cream. The road trip then usually leads to downtown Reykjavík. Our Project Manager of Tourism goes to "Huppa", where he buys a large, very creamy McFlurry type of ice cream filled with sweets, fruits, and other goodness. The road trip often ends in Hafnarfjörður. The Project Manager of the City Card goes to his local ice cream shop "Yo-yo" in Kópavogur which makes yogurt ice cream and has a large selection of toppings. It's also fun since it has a DIY approach where you serve your own ice cream. The Head of The Tourist Info prefers a few scoops of Valdís in the Grandi area, where the road trip will take her to The Old Harbour, Grótta and The West Side. You can find a full list of ice cream shops in Reykjavík on our site.